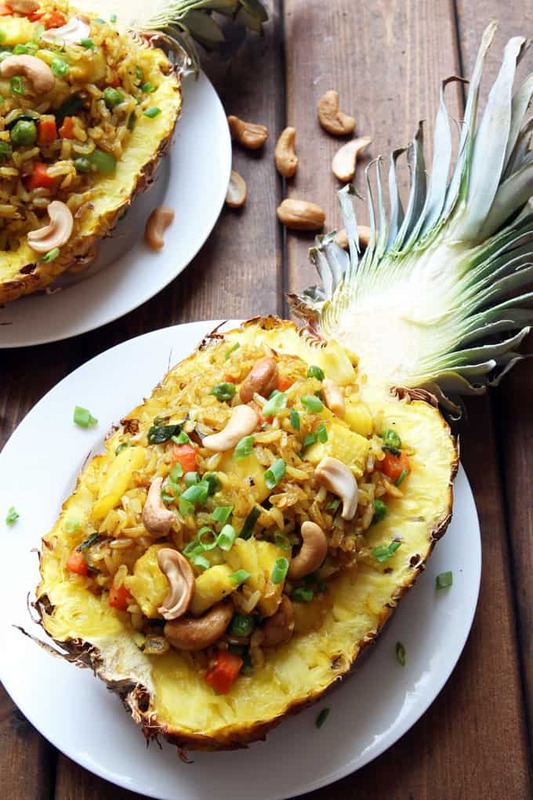 This delicious Thai Pineapple Fried Rice with cashews is baked inside a carved pineapple for a unique tropical twist and extra juicy pineapple flavor. This vegetarian meal can also be served with a protein of choice. Can be made gluten free and clean eating. Today I am updating another great recipe from the recipe archives with a video (find it up top). This Pineapple Fried Rice was and remains one of Konrad’s favorite Thai food recipes. A lot has happened since I first posted this almost 2 years ago. Most significantly, we lived in Thailand for 8 months where I took several cooking classes and learnt the Thai way of making fried rice. Turns out this version with peas and carrots actually comes closer to what they call ‘American Fried Rice‘. No matter the authenticity, this fantastic recipe is a keeper. I updated the directions a little bit to reflect the Thai cooking method I learnt while there. Otherwise I am leaving the rest of the post as is. This year will be our first Valentine’s Day since we had baby Olivia. I am not even sure, if we are going to do anything special. Having worked in the restaurant industry, I avoid certain places on regular Friday and Saturday nights already. The thought of going out on a busy Valentine’s Day Saturday is anything but romantic for me. This Thai Pineapple Fried Rice recipe is one I developed with Konrad in mind and I know he wouldn’t mind having it again for a romantic Valentine’s dinner at home. He is a rice lover through and through – he will have it over pasta any and every day. During our time spent traveling Southeast Asia Konrad discovered his favorite way of eating rice: pineapple fried rice baked inside a hollowed out pineapple. I don’t know how typical a Thai dish this is (considering an oven isn’t a standard Asian kitchen appliance), but we have only ever had this dish in Thailand. The first step after halving a ripe sweet pineapple, is to carve out the pineapple halves. I found it easiest to cut a rectangle first and then cut out individual slices. Cut half of the flesh into chunk to use for the recipe and store/freeze the rest for another use – like this healthy pineapple whip or my go-to mango pineapple green smoothie. To keep the fried rice from getting too mushy in the pineapple shell, I pat it dry with paper towel first, then bake it empty for about 5 minute to dry out even more. Covering the leaves with foil will keep them from burning. 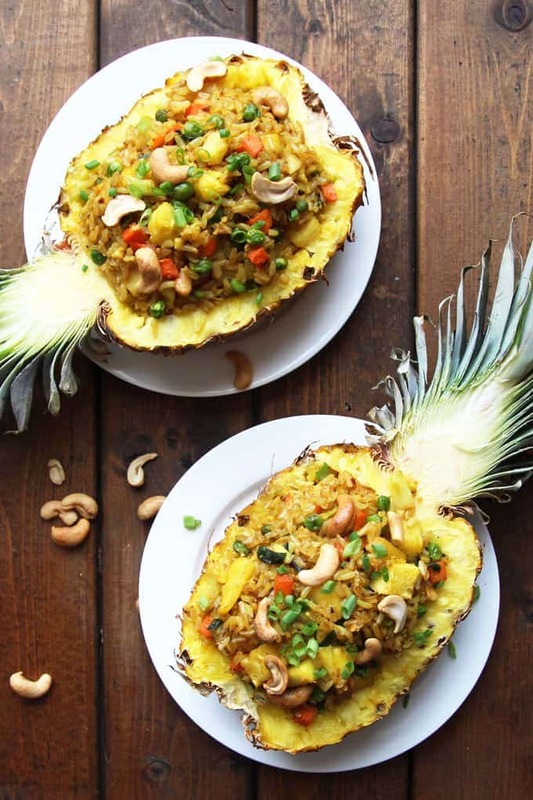 Once the pineapple fried rice is prepared, divide it between the two carved out pineapple halves. It will pile high. And bake for another 10 minutes to heat through. 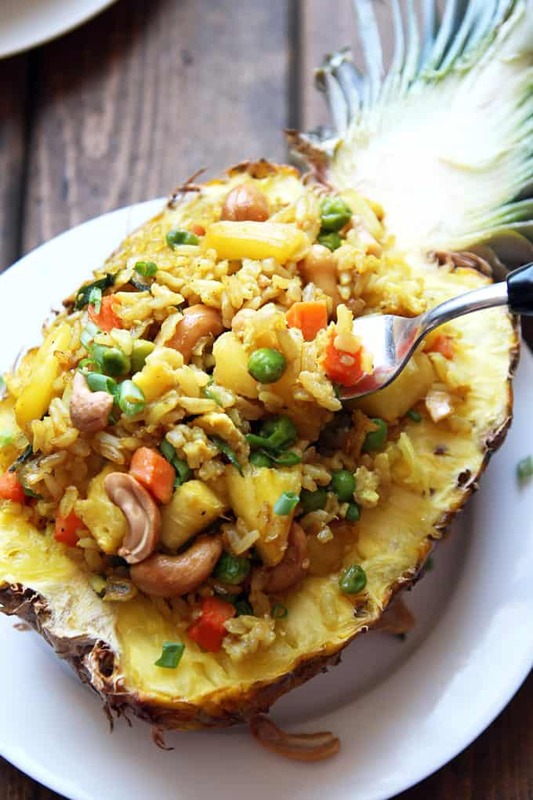 Being baked inside the pineapple imparts such a unique tropical flavor to the fried rice. Did you ever recreate a recipe from your travels? 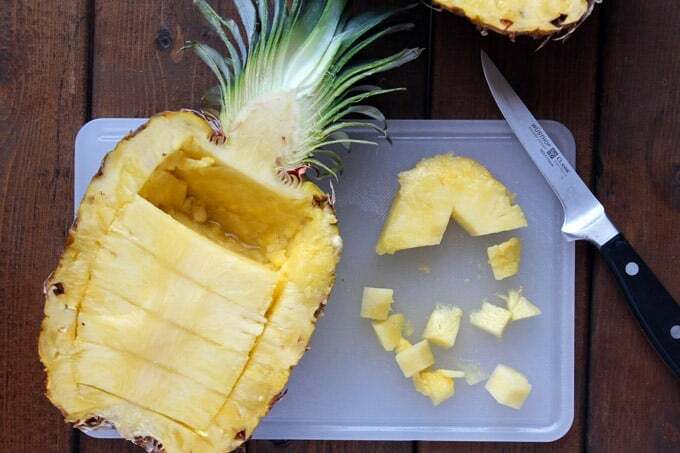 Prepare the pineapple by cutting it in half. Carve out the flesh while leaving the skin intact to create cavities. Chop half of the flesh into small chunks ( about 1 cup) and set aside. Freeze remaining pineapple for other use. Pat the pineapple halves dry with paper towel. Cover the leaves with aluminum foil to keep from burning. Bake the pineapple boats for about 5 minutes to dry them. Heat 1/2 tablespoon of oil in a large skillet or wok on high heat. Add the eggs and cook without stirring for about 30 seconds. Then stir quickly to scramble and remove from pan. Add the remaining 1/2 tablespoon oil to the pan, stir in onion whites and garlic and stir fry for half a minute until fragrant. Add the thawed carrots and peas and fry for a couple minutes. Push the veggies to one side of the pan, then add the cold cooked rice. Stir fry on high while adding coconut milk, soy sauce and spices (salt, pepper, turmeric, coriander and chili flakes). Combine with the veggies from the side of the pan and stir scrambled eggs back into the rice. Add in green onion pieces, chopped pineapple and cashews and stir. 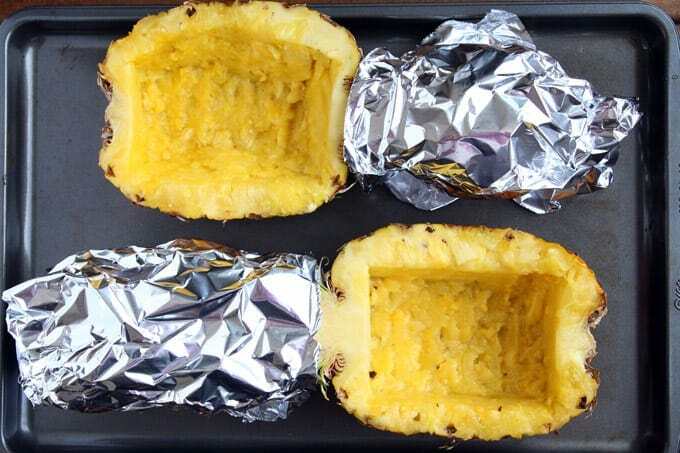 Fill into pineapple shells and bake for about 10 minutes until heated through. Garnish with more cashews and green onion. Serve right away. The version I made at home is meatless but any kind of protein can easily be added. We've had it with everything from chicken, shrimp to sliced sausage even. Hi! I recently had a Thai style chicken fried rice at a restaurant & it was AMAZING. Is this essentially a Thai style fried rice, just with pineapple?? Thank you! Also, I’ve loved every recipe of yours I’ve tried!! Any chance I could use canned pineapple for this?? If so, what kind should I use and how much? Thanks so much this recipe looks delish! Wowowowow this recipe is AMAZING!!! I made it with canned pineapple and LOVED it!!! Making it again today, I’m going to double the pineapple. Great recipe! My family loved it. I just swapped out the egg for follow your heart brand egg substitute to make it vegan (Could also use tofu and Indian black salt as a substitute) and it was perfect. 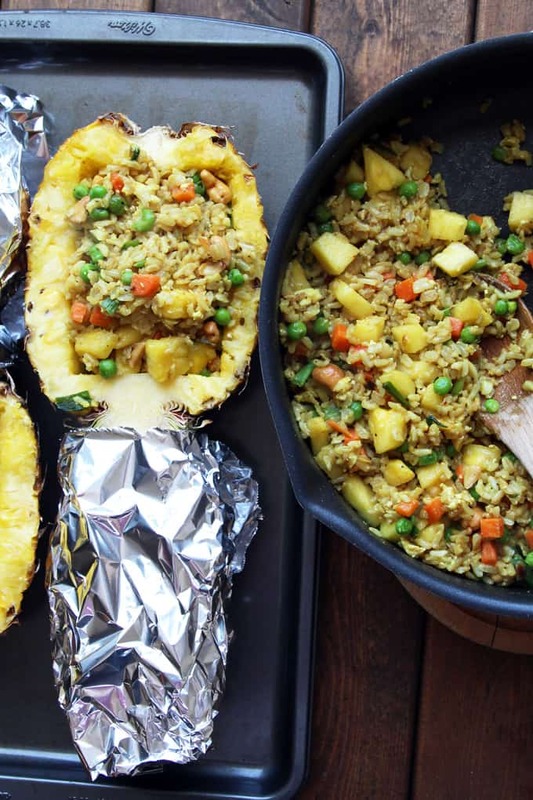 We just got back from Maui with 8 pineapples so this was a great way to use some of them! Thanks! Great recipe, thanks so much for sharing! The instructions were super clear and easy to follow and it turned out just great:) will definitely be making it again soon. You think I’m could grill instead of bake for 10 mins? Is this canned coconut milk? If so what do you do with the rest of the can. I hate opening a whole can for such a small amount. I always freeze leftover coconut milk in ice cube tray, to have small amounts handy. You can replace with broth it just won’t have the hint of coconut flavor. “Bake” is a little ambiguous without some sort of temperature setting. I’m going to go with 350° and hope the smoke alarms don’t go off. I LOVE this idea! What a beautiful presentation, too! What a good idea! Putting this at the top of my on my summer to-cook list. When making with shrimp, do you add it to the rice mixture raw before baking? Hey Jane, I would pan fry the shrimp first, and set them aside. Then make the fried rice and just stir the shrimp in when filling into the pineapple. Being baked for only about 10 minutes just warms everything instead of cooking it. Hope this helps. Thank you Jen and Emily! I love these photos. Your baked pineapple makes me feel like I am on a tropical island and would make a great dish for a Luau themed party. This looks super YUMMY, Regina!! Before discovering Khao San Road, I used to go to Spring Rolls for ‘Thai’ food. 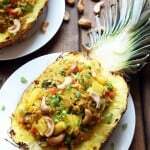 They have a dish very similar to this, served in the pineapple, as well. It was my sister’s fave! LOL…the food, from both the actual road AND the restaurant, is amazing! Why did I cook 2 eggs? My apologies. Looks like I missed the step of adding the scrambled eggs back in. It’s fixed now.